A professional musician of over forty years, Alec has always used magic in his performances to transform and inspire his listeners into states of being and realms of desire that leave them changed for the better. 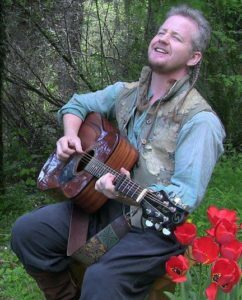 Using stories and songs of Antiquity, he creates places where the audience can find their unspoken secrets and address them with new inspiration. With twenty albums, a few spoken word stories and many collaborations with other musicians, Alexander applies transformational magic to his music in hopes of changing things that need to be changed. Heir to the music and legend of Heather Alexander, Alec performs her music, and his, own with a style that goes beyond reality and into the imagined. He works with the calibre of musician such as SJ Tucker and Betsy Tinney in the band Tricky Pixie and has recorded in Abbey Roads Studio, London with Fox Amoore. It is his deepest desire to inspire his audience to find their inner truth and bring it into life, realize their dreams and empower their own personal magic. A student of Celtic histories and mythologies and being taught music before he read books, he assumes the mantle of Warlock as an agent of Free Will and defender of Personal Truth. Not an Oath Breaker in the traitorous way, but in the transformational way. He will stand in the Dark in order to see the Light and show others the path. With workshops on the history and personal interpretation of the path of Warlock, he hopes to find more practitioners who will be willing to defend and empower Personal Truth with Personal Responsibility. In workshops on Magic in Music and Finding Your True Inner Voice, Alec has enjoyed opening the minds of many and the hearts of many more.